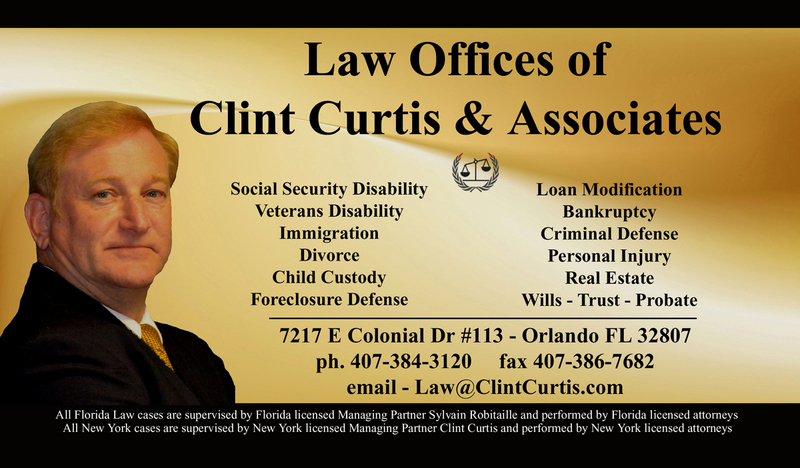 At the Law Office of Clint Curtis and Clint Curtis we guarantee that your will be provided with personalized service from your Attorney. Many firms get lost in the business of providing legal services to their clients. They fail to return calls and often the client is never able to speak to anyone but a paralegal or receptionist. Many disability clients never actually meet their attorneys prior to a few minutes before their hearings. This is not the way that we our firm practices law. Even though we have grown to several offices, including international offices, the client will receive personalized service from their attorney. We require that our attorneys respond to any client inquiry on a timely basis and that contact will be from your attoney, not just the attorneys staff. This means that you will be constantly informed as to the status of your case as well as be confident that we are providing you with the best legal services that we possibly can. Knowing your case and understanding your expectations will provide you with the piece of mind you deserve in such trying situations. All Florida Law cases are supervised by Sylvain Robitaille, a Florida licensed managing partner of the firm and performed by Florida licensed attorneys.